It’s the moment we’ve been waiting for since that first triple digit day – fall! That glorious time when there’s a nip in the air, we pull out the jackets, keep the coffee pot running, and use inordinate amounts of nutmeg and cloves in our treats. And sometimes begin to hear a squeaky wood floor in our homes. As temperatures start to cool, the levels of humidity in the outside and inside environments are also shifting from balmy to dry. As soon as you turn your heater on, you’re removing even more of that precious moisture from the air. If it is not replaced, your floors will start to tell you about it in a very audible fashion. So grab your pumpkin spice latte and let’s find out what your floors are telling you when they start squeaking. The easiest fix for a squeaky wood floor is to stop walking on it. That isn’t realistic but it indicates the root problem with this issue is there is movement somewhere. Once you figure out where the movement is and is coming from, you will be able to quiet down your floors again. Find out why your floor is moving in this article. squeak, take a few moments to listen to what your floor is saying. Start out by checking your RH levels. 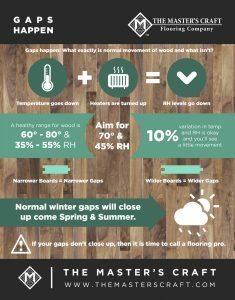 Gaps are also a symptom of decreased RH levels. If the problem persists for more than a season, figure out what type of movement is going on. There are some easy fixes depending on what you’re dealing with, and if ever you need a second opinion with what your floor is trying to tell you, stop by one of our shops and we’ll be happy to help. If you are noticing the squeaking during the extreme points in summer or winter, then the movement is related to the environment. In the peak of winter, floors will naturally be drier – your home can be drier than the Sahara at times. And dry air = shrinking and gaps. Once the weather shifts, it will go away. The inverse is true for summer when wood swells. 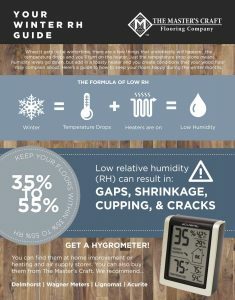 To keep this from being problematic, you should have a humidifier to add moisture back into the air and maintain the 35-55% RH that your floor needs to be happy. So squeaks are a good reminder to turn on your humidifier and do any necessary maintenance to the unit. Don’t have a humidifier? Learn more about humidifiers here. This happens when two boards are rubbing where they meet. This type of squeak is localized to one area or to only two boards. You will also be able to see movement with this type of squeak. If you can take a step away from one squeaky area to another, your problem may be with the subfloor. These squeaks will cover a larger area than just two boards and if you were to see movement, it will be through a larger section of the floor. 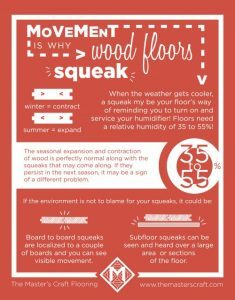 If you have a squeaky wood floor that is going on past a seasonal change, then it may be time to look into what else can be going on and call a professional. There are two different areas where these squeaks originate. We would be happy to answer any questions you have about your floor as well.  Find the nearest Master’s Craft location here. Screws from underneath to seat the flooring to the subfloor in problem areas. Squeak No More: http://www.oberry-enterprises.com this method will allow for top screwing boards, but counter sinking the screws. Lubricants: This may sound a little hokey, but talcum powder, graphite, and WD-40 are all solutions that have helped squeaking floors. This is usually somewhat temporary. 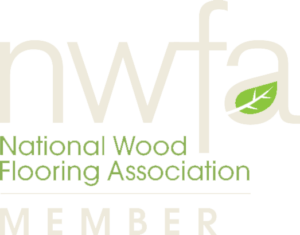 One NWFA certified inspector swears by WD-40 as a solution. In these cases, the movement is causing friction between the flooring boards. When this is the case, lubricating the friction points will eliminate the sound. Need more help? Check out our tutorial videos and learn how to silence your squeaky wood floor. Click here to see our full Youtube channel. Fix your squeaky floors with talcum powder! Fix your squeaky floors with WD-40! I just had 2000 square feet of #1 white oak installed 4″ wide, unfinished. It creaks and groans on every square foot throughout. there is not a spot in the total laid floors that you walk on that doesn’t creak. My instaLLER is telling me they will “quiet down”. Is that correct? Hi Jonathan – do you remember if your floor prior to this one squeaked as well? A new floor won’t necessarily make an old squeak problem go away. If your subfloor material or the joists holding it up are warped, bowed, or weak then a new wood floor won’t always fix it. This can also happen when going from carpet to wood flooring. Carpet can follow the contours of a warped subfloor and won’t really cause any new squeaks. But when a rigid wood floor is installed over a poor subfloor squeaks are often a common result. Movement causes squeaks, and in general this isn’t likely to go away over time. i’ve tried all the tactics found here. no luck. i’ve resecured the boards to the joists and the squeak persists. the noise appears to come right under a wall that seperates the hallway and closet on the other side, which i’ve also resecured with Squeak No More screws. no access below floor as it is second floor. any ideas of how to address this problem? That sounds like a frustrating problem! It seems like there may be a bigger void underneath your floor that is causing movement and the screws aren’t able to hold the boards down enough to eliminate the movement and the squeak. There is a product called Dri Tac Solid Wood Repair Kit (they also have one for engineered) that may help. It would inject adhesive underneath your floor to fill in any open areas that might be causing squeaks. It’s not a cheap fix, but perhaps something to consider. It also might be worth having a professional come out to take a look. Good luck! Hi Sue! Many people have homes where they cannot access their floors from below to fix parts of the subfloor that are moving and causing squeaks. I would recommend trying the Squeak No More kit that we talk about in this article (see above). There is a break-away screw kit for carpeted floors that can help secure your subfloor to the joists and help reduce the squeaks. Hope this helps! We moved a large heavy antique armoire upstairs to my bedroom with carpet over a composite subfloor. The floor squeaked some before, but now the squeak has spread to a much larger area/s. I really want this armoire there but I don’t want to damage our home. Matthew, it’s likely that this heavy piece of furniture is causing some of the joists or other components of the subfloor to bend, deflect, or warp in some way. Even a slight bow or bend in your joists may create space or other voids in-between your floor and subfloor. These voids will then create squeaks when the floor is walked on. You may try to put a wide, flat board (plywood or other flat piece) underneath your armoire in order to spread the weight of the armoire out over more joists underneath the floor. If you can spread out the weight of the piece it may help eliminate some of the squeaks you are hearing. Ultimately, your floor may not be strong enough to handle this furniture piece without warping your subfloor. Please use caution, and consider getting a professional to evaluate the load bearing capacity of this area of your home and ensure that the room beneath this level in your home is not occupied by anyone if you are at all concerned that the floor is not strong enough to hold this much weight. Thanks for the question! Definitely what my concern is can the actual structure support it. Dispersing the weight was something that I thought about too. I’ll work on that this weekend. May just decide to give the furniture piece up I’d rather be safe. Our floors had carpeting and in different areas laminated flooring. The floors squeak all the time, all over…there are some spots that don’t squeak but each greater area has many squeaking parts. We are pulling up all our carpeting and the laminate and putting in engineered hardwood floors. We have already started pulling up the carpet. It seems like now is the time to fix these squeaking problems ( while the plywood is exposed), but we are not sure how to go about doing that or who to call to assess what is really needed. It seems like the suggestions about the plywood and subflooring not being attached properly may fit our situation as it squeaks no matter what season it is and it still squeaks when we are walking on just the plywood. Do you have any suggestions for us? Hi Dori! I think you are on track here. If your plywood subfloors are squeaking, it is likely due to the way the plywood is fastened to the joists beneath your floor. If you have a crawlspace or basement with exposed ceilings, you can have one person look at the floor from below while someone else walks around on top. You will likely hear squeaks, and see some movement. Remember: movement is what causes squeaks. If you can identify what parts of your floor are moving (either the joists, or the plywood panels themselves), you can then have a better idea of what needs to be tightened up to stop the movement and stop the squeaks. Good luck! The four year old tile floor in our bathroom started squeaking during winter (after four years) and stopped squeaking in summer. One tile has a hairline crack now. Is this from humidity ? . The grout in an a-joining bathroom cracked also after squeaking in winter. It was about three years old. After dealing with breast cancer and an auto accident, I am heartbroken with this issue. Mary, I understand that flooring problems can be really frustrating, especially when dealing with big life issues like you have experienced. Relative humidity could certainly be a factor in causing cracks to appear in your tile. When homes dry out in the winter, and then expand in the summer it can create movement in subfloors and walls. Tile and grout is especially prone to cracking when there is movement in the subfloor or walls. You may want to get a small device called a hygrometer (usually around $15) that will measure the relative humidity in your home. It is best for most floors to keep your home consistent between 35-55% relative humidity. Best wishes to you! I think you pin pointed the issue. Do I place the humidifier in the basement under the bathrooms or in the bathrooms ? The ceiling under one bathroom is finished. The ceiling under the second one is not finished. Thanks so much ! A humidifier in the room that is experiencing issues cannot hurt, however, it may be best to consider having a whole home humidifier installed as it will more evenly condition the air throughout your home. A single room unit may not be able to keep all the air in your home at the recommended range of 35-55%. If the ceiling is finished underneath your room, it will likely not help to have one in the basement. However, if you have exposed ceilings in the basement it may be better to put a humidifier there to keep the subfloor from being exposed to extremely dry air. Good luck! What if the squeaks were occurring after the contractor intervened and removed the old flooring? Some worker fell through for ceiling near the area where there is a large squeak that we didn’t have before the flood. We kept telling them to fix it and asking what the cause was but they kept saying I can’t hear it, it’s normal and resonator, and so forth. But I’m thinking maybe the person hit a support beam when he fellc(supervisor, first day) Insurance never came to inspect it and contractors worked faster than ever had for tbeir overall work period. But the issue was the subfloor or under the subfloor which is causing some issue and is very disruptive and annoying. And is an indicator of their work performance right? Did I mess up not inspecting rhe new damage in more depth and detail? And they laid the floor on without pause to address the issue which didn’t exist before renovation but does cause harder case to fix. Just messed up situation overall and can’t find proof I need to hold them accountable. Any info is appreciated. Thanks. Wow, Shane! I hope that person is ok. It sounds like there is definitely some structural issues going on and that could definitely lead to squeaks that don’t have anything to do with the subfloor directly. If your joists or beams are not sound, or somehow warped or unstable this could definitely be part of the reason your floors are squeaking. You may need a professional home inspector or flooring inspector to help you sort this one out. We are looking at buying a house built 22 years ago that has creaky hardwood in the hall. The floor looks looks great. Will we need to tear it up and replace? The hall leads into the kitchen which is Lino and this creaks badly, could the cause be the subfloor? Hi Nicola, it is likely that the subfloor is the issue. There are a number of ways to tighten your subfloor and eliminate movement, which causes squeaks. It would be best to have a flooring professional give you a consultation to make sure you identify the source of the squeaks. We bought a house built in the 1950’s and t has hardwoods throughout. All the floors make noise! Not really a squeak, more like a crack. Almost every step sounds like a gunshot, but not as loud of course, but not squeaky. Any thoughts? Movement is always what causes squeaks. It may be that the fasteners (nails) that hold your floor down have come loose and whenever you are stepping on the floor it is causing the loud noise you are hearing. You may want to have a flooring professional look at your floor, and figure out ways to tighten the floor. This could be done with screws from below the floor (if you have a basement). Hope this helps! I’m very nervous on the entire top floor of my house. I can feel my husband when he walks on the floor in my bedroom while laying in bed. Is it possible to fall through a squeaky floor? Hi Candace, I doubt anyone could fall through a squeaky floor. But, if it’s really bad you should probably get it checked out by a flooring professional. Good luck!